Malaysia's high car prices and subsidised fuel. A 1.8E Toyota Altis (Corolla) would cost RM119,000 in Malaysia but only $18,180 (approx RM56,000) in the US. The difference is RM63,000. We know that the fuel price in the US is much higher than our subsidised RON95 but the point here is that, we the consumers pay upfront subsidy of RM63,000. 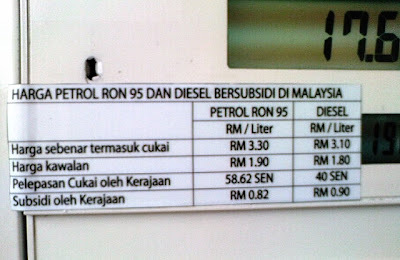 Take the government subsidy of RM0.82/litre (in the pic) and say you refuel 50litre/week, you enjoy subsidy of RM41 a week or RM2,132 annually. If that is your refueling pattern, how long do you think the RM63,000 will last you? More than 20 years I reckon. So, would you support subsidised fuel or get a better car at lower price and manage your own fuel consumption. I think it is smarter that way. The blanket subsidy that is practiced in our country benefits not the poor but the middle-income and the rich population. I read in The Star that 71% of fuel subsidy was enjoyed by the middle to high-income level groups (Source: Pemandu). If it is up to me, I'd rather buy an Altis at RM56,000 and pay RM3.30 for my petrol; I'm still better off financially 20 years later. Do subsidies on energy hurt the economy? And ultimately the masses? "We have been hearing about countries that are finding that the fiscal weight of energy subsidies is growing too large to bear. In some countries budget deficits are becoming unmanageable and threatening the stability of the economy." - IMF first deputy managing director David Lipton, in Washington. 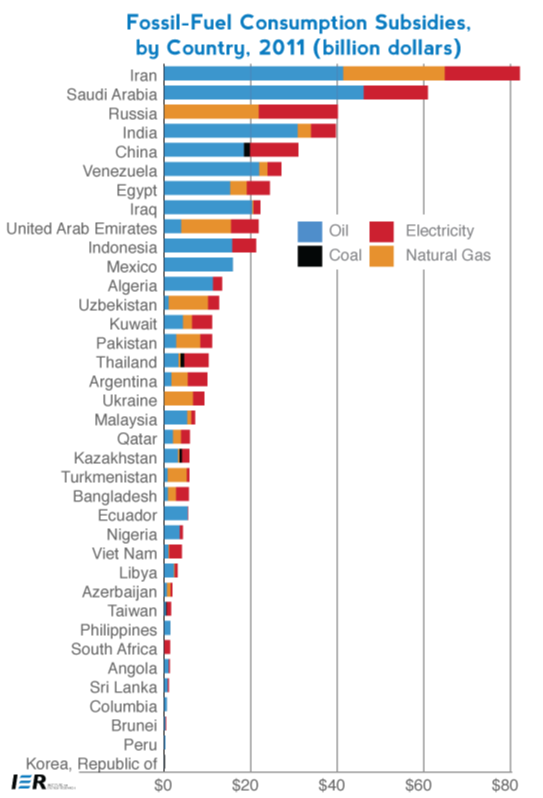 Source: International Energy Agency, World Energy Outlook 2012, Energy Subsidies via IER website. WASHINGTON – The International Monetary Fund urged countries to reduce subsidies on energy, saying they worsen government’s fiscal positions and eventually create more advantages for the wealthy instead of the poor. In a broad-reaching report, the IMF said subsidies of oil, petrol and electricity are aimed at helping consumers, but end up costing them as governments struggle to shoulder the cost burden. Moreover, the study said, subsidies encourage energy waste, discourage investment in energy-efficient industries, and exacerbate pollution and global warming. Worldwide the direct subsidies on energy — when consumers pay less than the basic supply costs — amounted to $480 billion worldwide in 2011, according to the IMF. If post-tax subsidies are counted — when the prices do not cover such things like the negative impact on the environment — the government support worldwide measured $1.9 trillion. Most of the subsidies are in oil exporters, where they contribute to speeded-up depletion of a natural resource.But energy importers suffer especially as global oil and gas prices have risen over the past three years. Many have not responded by adjusting domestic energy prices to match the increases — and so expanding the fiscal burden of subsidies, according to the report. Lipton said 20 countries in the world maintain subsidies that top five percent of their GDP.Such subsidies “remain a stumbling block to higher growth by squeezing out much needed health, education and infrastructure spending,” he said. But the report points out that, if post-tax subsidies are counted, the largest offenders are the United States, China and Russia — together their subsidies reach nearly $900 billion worth. Car prices will be slashed 20% to 30% a year without cutting the above subsidies. Laughter is the best medicine - really? How does a bulletproof vest work? Sizing up wind turbines: How big are they?